Learn how to make a Puffy Origami Heart with these clear origami instructions. These are perfect decorations for Valentine's Day, they can be hung, used as pendants, strung up as garlands, or you can stick them on the ends of chopsticks, straws or pencils. 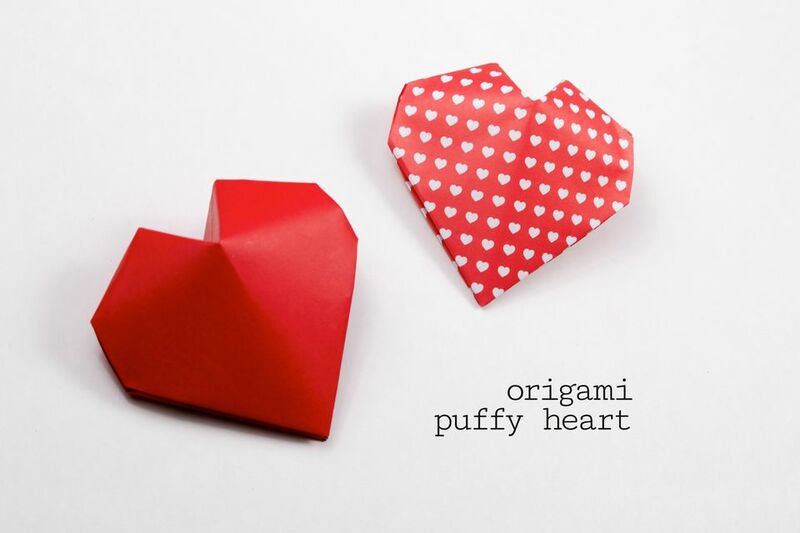 These puffy origami hearts also open up like clams, if you use paper that is thin but quite strong, and add a tiny bit of glue on the flaps in step 29, you can use this as a gift box for jewelry or maybe even an engagement ring! 1. Start with white side up. Fold the paper in half, top to bottom. Unfold. 2. You need to make a pinch, about 2 inches long. 3. Make the pinch by folding in half right to left, and only creasing that area. 4. Fold the right and left into the middle. 6. Fold the paper in half, top to bottom. 8. Fold the top right corner in a bit, imagining that the top has 4 equal sections, this doesn't need to be exact. 9. Fold the left corner down, Only at the diagonal next to the right corner fold. 10. Repeat on the left. 11. You should see a V in the center. 12. Fold the corners inwards as shown. 13. Open the paper up again. 14. Fold the bottom left and right corners into the middle. 15. Unfold and then fold the corners to the previous crease. 16. Reverse inside fold the crease made in step 14. 17. Open up the front layer whilst keeping the flap inside together. 18. Fold the little flap behind itself along the crease you created in step 15. 19. The result. If you don't understand this part, you might need to use a bit of glue at the end. 20. Do the left side. 21. Rotate the model so that you are working on the opposite edge. 22. Fold the bottom left and right corners into the middle. Unfold. 23. Fold them to the previous creases. Unfold. 24. Inside reverse fold the previous crease. Repeat on the left. 25. Pick up the heart, reverse fold the left and right corners. 26. Reinforce the diamond as mountain folds. 27. Close the heart, whilst pushing down on the diamond at the top. 28. Open it a bit and look at the flap on the top right. 29. Similar to the flap we secured on the bottom, flip this little flap within the front or behind itself to secure. 30. Use a chopstick or something to make it easier. Use some glue if you don't understand this step! 31. Now you can insert the flaps on one end of the heart into the pockets. 32. Mine got a bit squashed, so we used the chopstick to pop it out again.